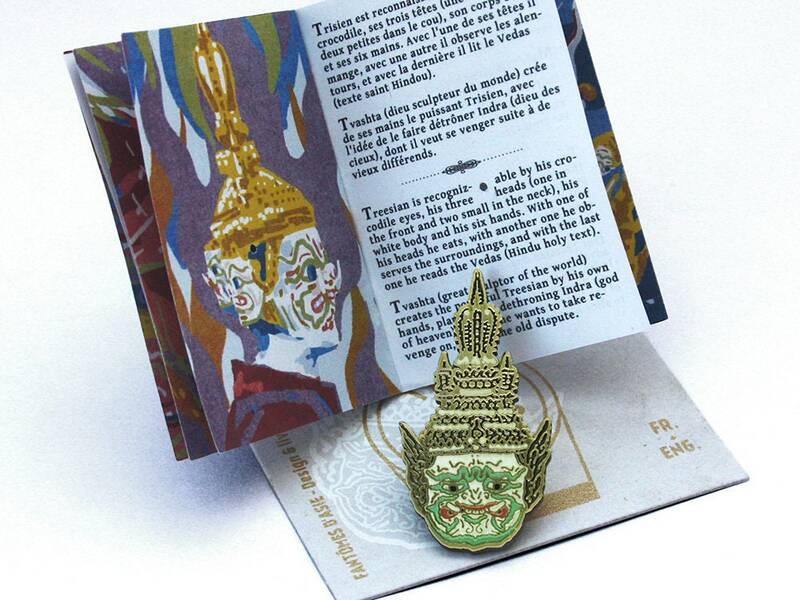 This lapel pin features the main face of demon Treesian, a character from Thailand's national epic story, the Ramakien. He is known for his crocodile's eyes, his white skin and his three faces (the other two are behind his neck). 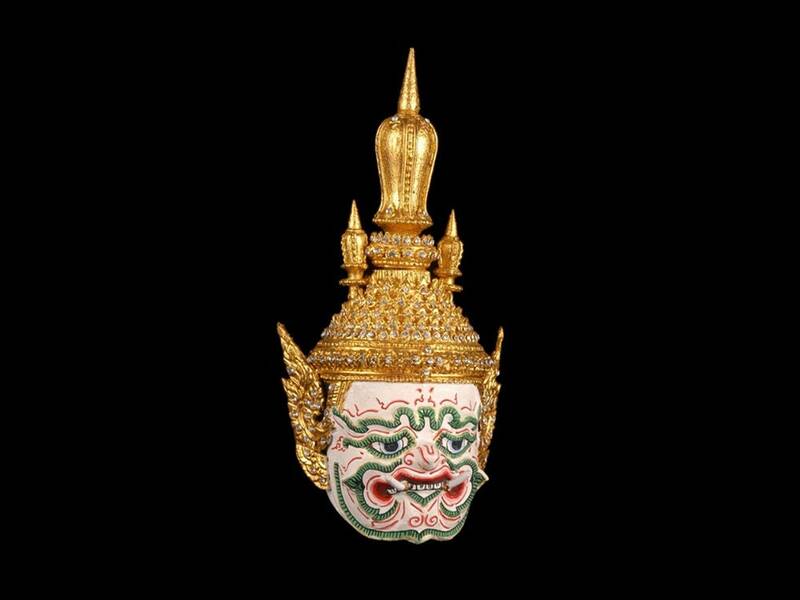 We adapted it from a his character's Khon mask. 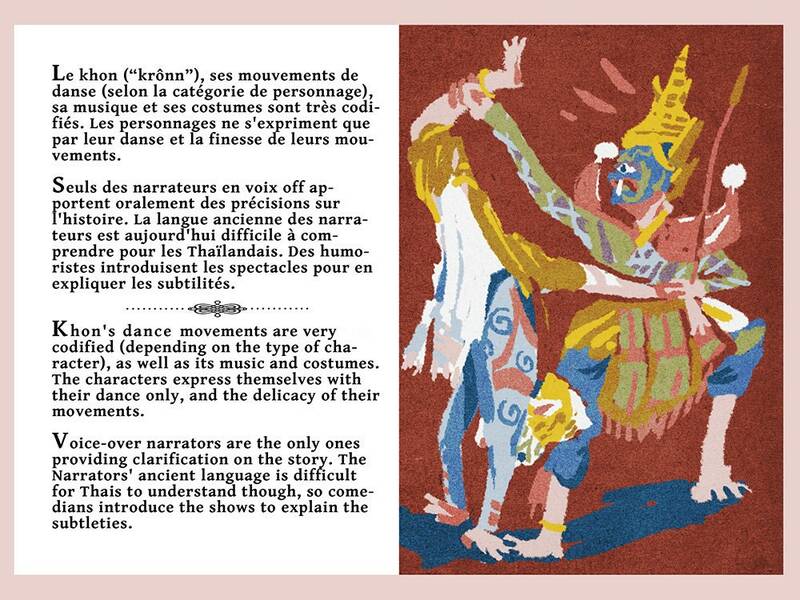 Khon is an ancien Thai art form in which dance, music narration and acting interwind. Treesian is known for his will to defeat Indra (god of the sky), and his death, killed by the latter. 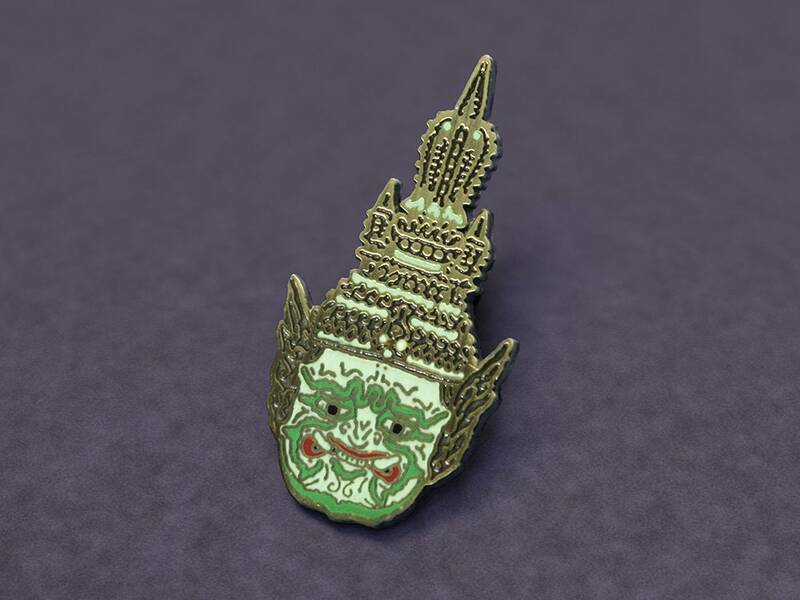 This lapel pin was created for the exhibition "Ghosts and Hells, The underworld in Asian art" at the Quai Branly- Jacques Chirac Museum in Paris. 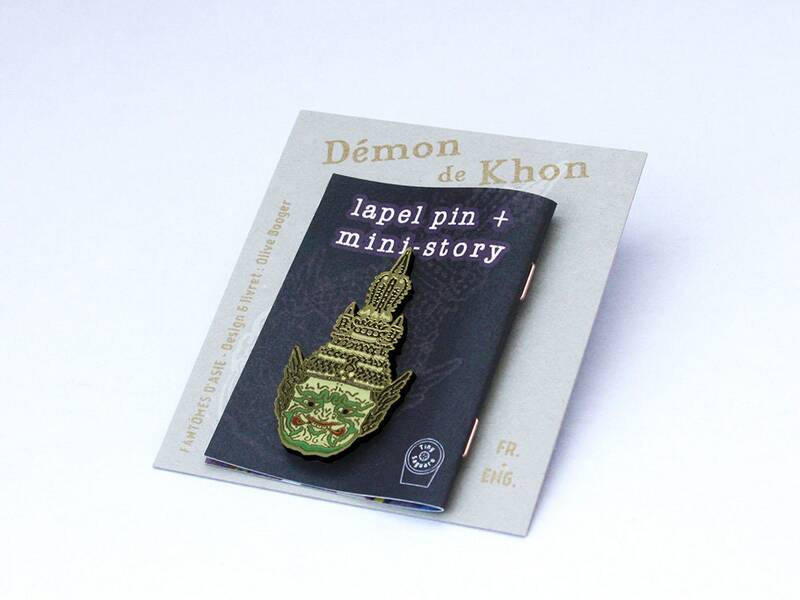 Collection "Youkais and asian spirits"
Like all other Tiny Saguaro pins, this Khon Demon comes along with a 12 pages (full color) minicomic (in English and in French). 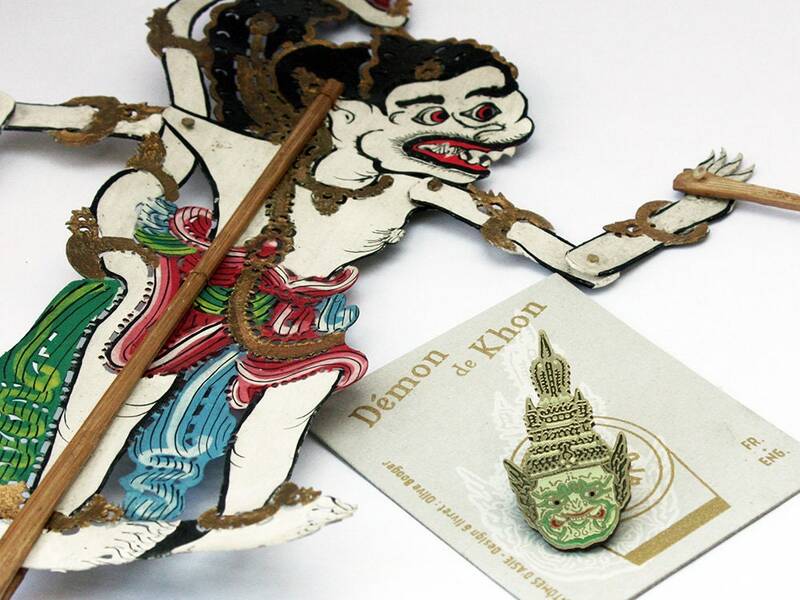 This one tells fun facts about Khon dance and Treesian demon. It all comes with a screen printed card and a clear plastic envelope. Khon is a dance drama genre from Thailand. It is traditionally performed solely in the royal court by men in masks accompanied by narrators and a traditional piphat ensemble. A khon story has many characters. The most famous characters in the story are the monkey warriors, Hanuman and Phra Ram. While the ogre and monkey characters wear masks, most of the human characters do not. Khon is based on the tales of the epic Ramakien. The Ramakien is Thailand's national epic, derived from the Hindu epic Ramayana. 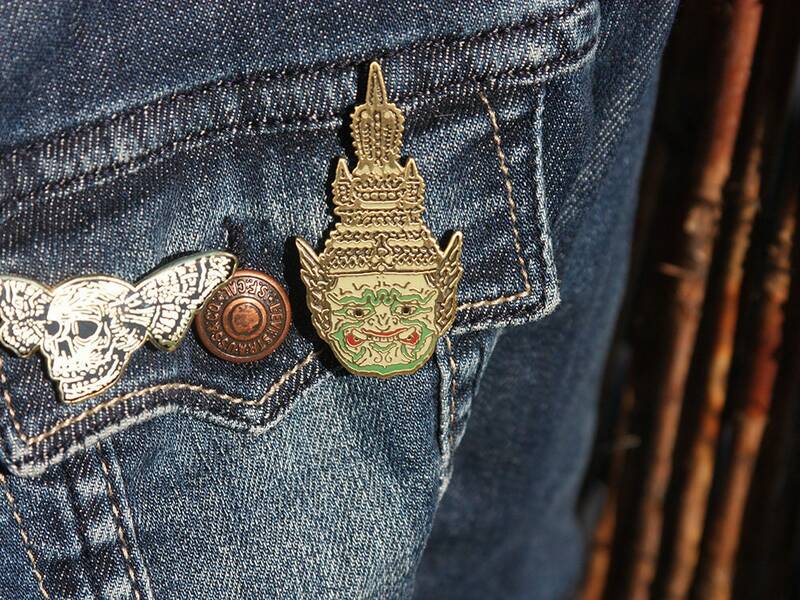 While the main story is identical to that of the Ramayana, many other aspects were transposed into a Thai context, such as the clothes, weapons, topography, and elements of nature, which are described as being Thai in style. The Ramayana, holy revered text of Hindus, is believed by many archaeologists and historians to be a collection of stories from Hindu legend concentrating on the work of the gods in the lives of men, and was first written down, as legend states, in the forests of India by Valmiki in the fourth century BC. Nevertheless, the Ramayana came to Southeast Asia by means of Indian traders and scholars who traded with the Khmer kingdoms (such as Funan and Angkor) and Srivijaya, with whom the Indians shared close economic and cultural ties. Treesian (aka Trisiras, Trishiras, Trishira, Trisian) is twin of Saranyu, as well as the three-headed son of Tvashta and grandson of Hiranyakashipu . He was created by Tvashta to dethrone Indra. With one head, he ate; with another head, he observed his surroundings; with his last head, he read the Vedas. He grew so powerful that Indra became frightened of him, especially after Trisiras scorned the women Indra sent to seduce him. Indra killed him and Trisiras' father, Tvashta, created Vritra to gain revenge. Très beau et original.Identique aux photos du site. Envoi rapide et très bon contact,à recommander sans hésitation ! 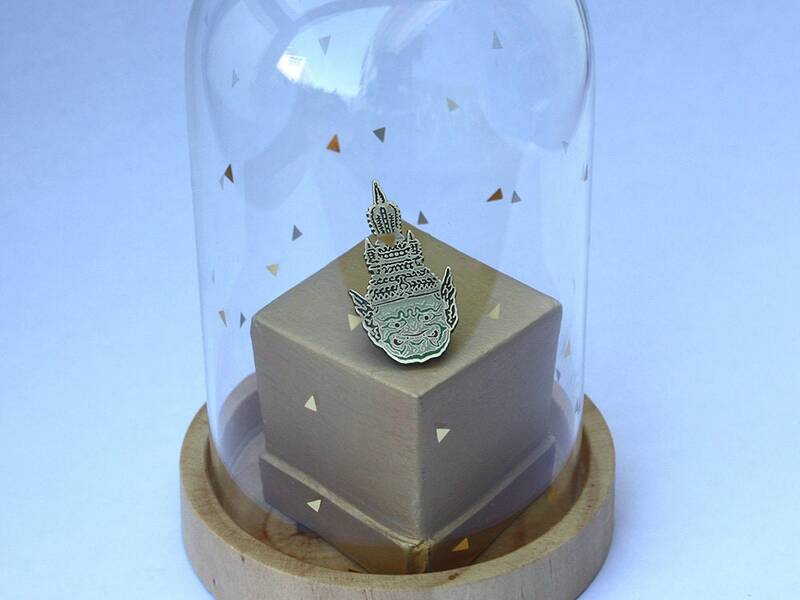 Pin's reçu très rapidement et accompagné d'une petite carte postale très sympa ! 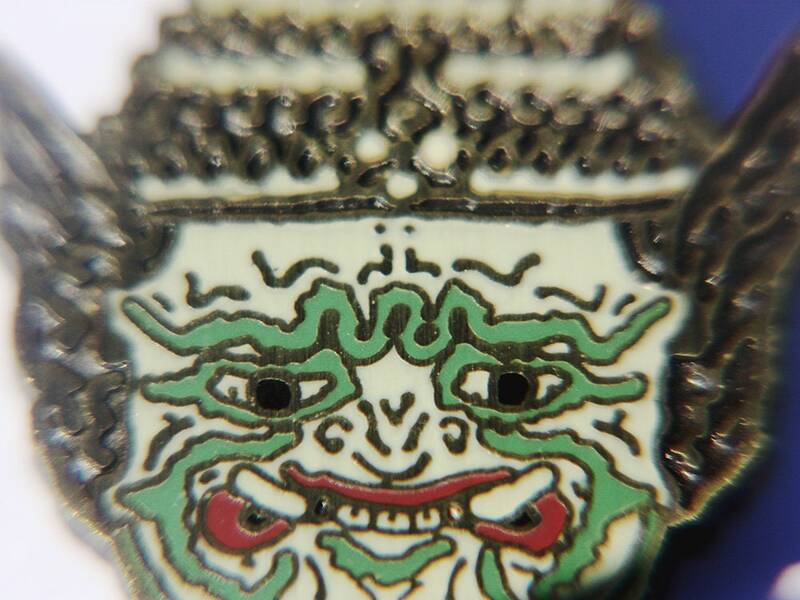 Je retrouve dans ce pin's là des souvenirs asiatiques qui ont blanchi mes nuits de petite fille : un masque de ce type était au mur et selon la lumière et l'angle de vue il apparaissait tantôt merveilleux tantôt effrayant ! 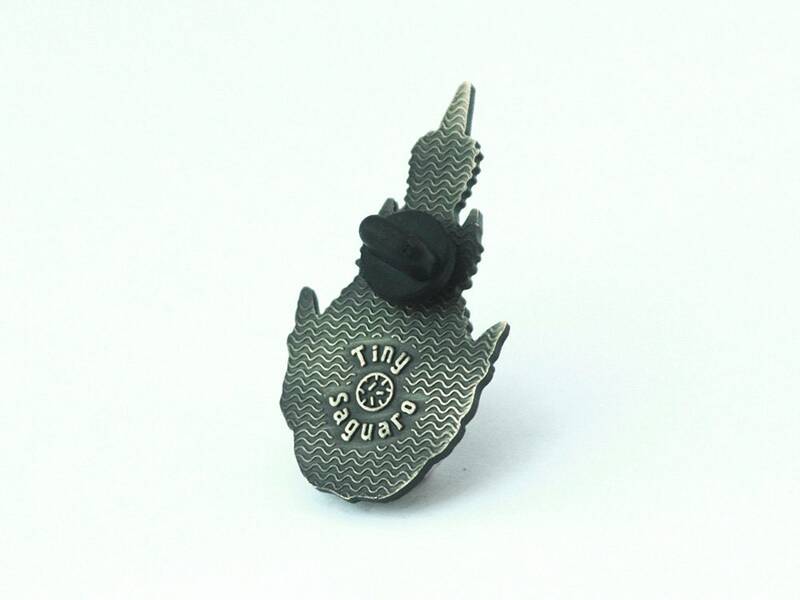 Ce pin's a ce pouvoir là aussi : dieu ou démon selon le point de vue...j'aime beaucoup !